Get the latest Powder Handling news & information delivered monthly, direct to your inbox. Bulkpak™ Heat Sealers by Tetra Pak® are designed for sanitary closing of all bulk bags or bins with plastic barrier liners suitable for heat sealing. They ensure a perfect seal regardless of the film thickness. A high quality uniform seal is achieved through the combination of an even pressure across the bag width and preset seal temperatures that are maintained during the heat sealing cycle. Ceramic coated seal bars provide long lasting electrical insulation of the heating elements. Flexible heat sealing settings, such as sealing and cooling temperature and seal time and pressure, enable reliable, safe and consistent operation that can be carried out by all personnel. Bulkpak Heat Sealers by Tetra Pak come in standard or dual designs, with heat sealing elements located in one or both sealing bars respectively. The sealing bar working surface can be 1000 mm or 1450 mm long. The machine can be integrated within the existing bulk bag conveying system and require single phase electrical power and food grade air connection. Bulkpak™ 600 Postgasser – Heat Sealer by Tetra Pak comprises a single station for modified atmosphere packing and heat sealing of a wide range of plastic barrier liners. Postgassing, or replacing ambient atmospheric air with inert gas in fat-containing powders after the bulk bag is filled, reduces or eliminates product deterioration and ensures prolonged shelf life. To minimize powder surface exposure to the atmospheric air, the machine has to be located in the immediate vicinity of a filling station. Among the highlights of the Bulkpak 600 technology by Tetra Pak are powder deaeration and compaction for improved bulk bag stability in storage and transportation, dramatically reduced use of inert gas compared to a conventional pre-gassing process, and eliminated need for costly filter or valve attachments in barrier liners. The residual oxygen levels inside the bag after 7 days are typically under 3%. The filled bulk bag is conveyed to the postgassing – heat sealing station, where the operator loads the plastic bag liner and initiates the cycle. The probes go down into the powder and replace ambient air with a MAP gas, such as nitrogen. It is possible to perform individual stages of the cycle, such as only deaeration or only heat sealing. All stages of the cycle are timed and automated. An extensive range of testing and indication features provide the operator with comprehensive feedback on the process flow at each step of the cycle. Bulkpak™ 25 Inline Postgasser by Tetra Pak was specifically designed to enhance the functionality of 25 kg hygienic powder filling lines to pack powder and granular products in a modified atmosphere, achieving typical residual oxygen at levels under 3%, 7 days after closing. The operation principle is as follows. The 25 kg filling line conveyor transports the bag to the inline postgassing station. The bag is locked in place with the front and rear clamps. Once the cycle is initiated, the probes go down into the powder. Ambient air present in powder is evacuated by vacuum and replaced with an inert gas. The probes are removed from the powder and the bag clamps release. The bag is ready for air tight closing. 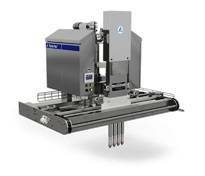 The unit is suitable for new or retrofit installations, with operation modes ranging from manual to fully automatic. It can be integrated into bag or box conveying lines, and is supplied with safety interlocks for connection to the factory PLC. Bulkpak solutions by Tetra Pak require very simple maintenance, with only few minutes required to replace the main working components. With technical support just a phone call away and with most spare parts available within 24 hours, Tetra Pak is committed to maximise the lifetime and performance of your equipment. Limited will be in touch as soon as possible. Sorry, there seems to have been an error. Please double check your details and try again.